I am a firm believer that no dream is ever a too big of a dream. If you believe it and if you make everything possible and impossible to make your dream come true – it will. Do you agree? Here’s a card I’d like to share today with a No Dream Is Ever To Big sentiment. I think this is a nice way to encourage someone to pursue their dream. I used a couple of products from Hero Arts to create this card. The background was stamped using my current favorite Stamp Your Own Plant stamp set, I’ve already shared a card using this set here and I have one more coming up soon. I used a couple of colors of ink to stamp the background – Wet Cement, Green Hills and Forever Green. I find these colors work really well together. 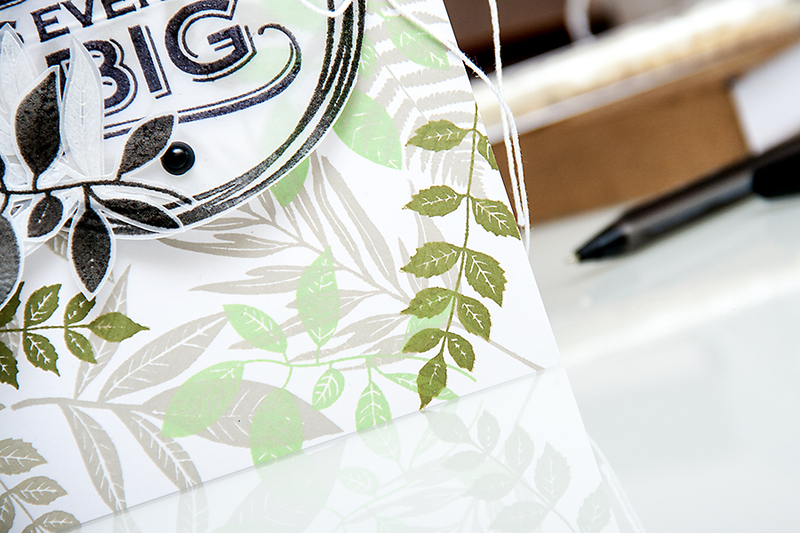 If you are curious to learn how I stamp patterns like this one, please watch THIS video tutorial – I’m using a floral stamp as well as several similar colors of ink and overlapping images to create a beautiful floral background. The technique used here is very similar. 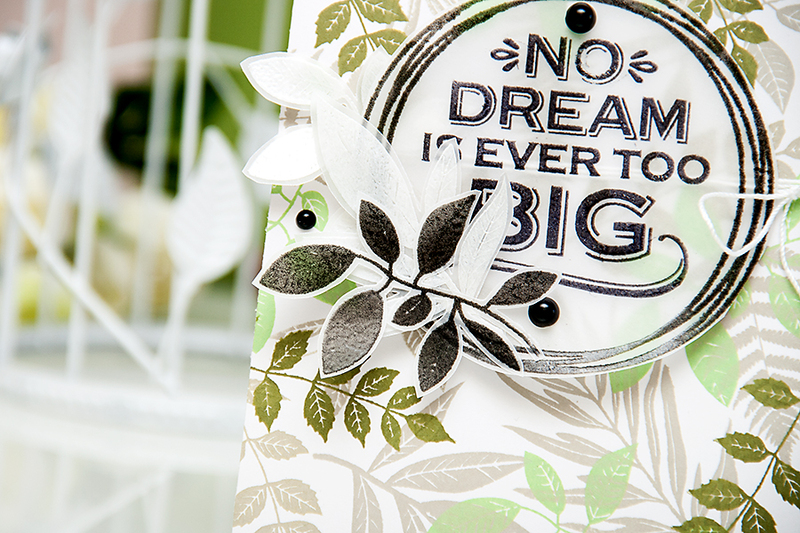 The No Dream Is Ever Too Big sentiment was stamped using black ink onto vellum and heat set using Clear Embossing Powder. 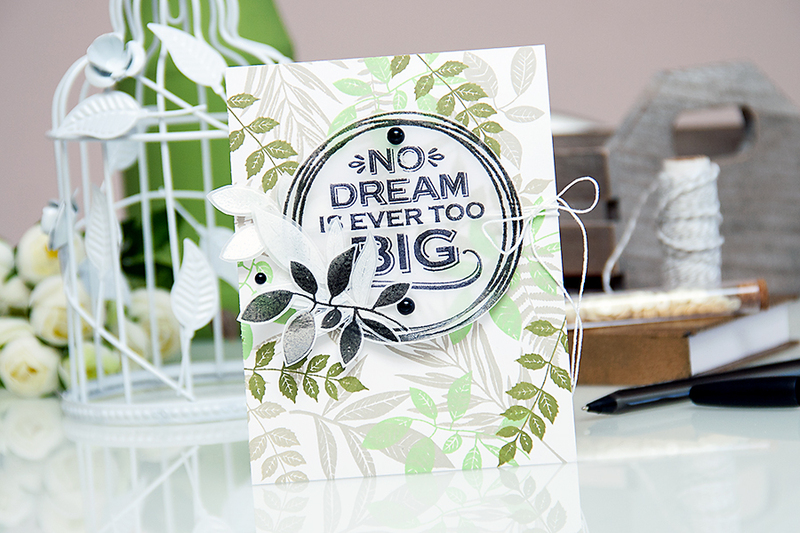 The frame around it (here’s another card using this stamp) and the black and white leaves were created using the same technique. I also added white floss and a couple of black gems to finish this project. I love to stamp various patterns to use on my cards and here I have a few of my favorites. Click on the image to go to the blog post and read more (many of these have videos). I just love the background you created! 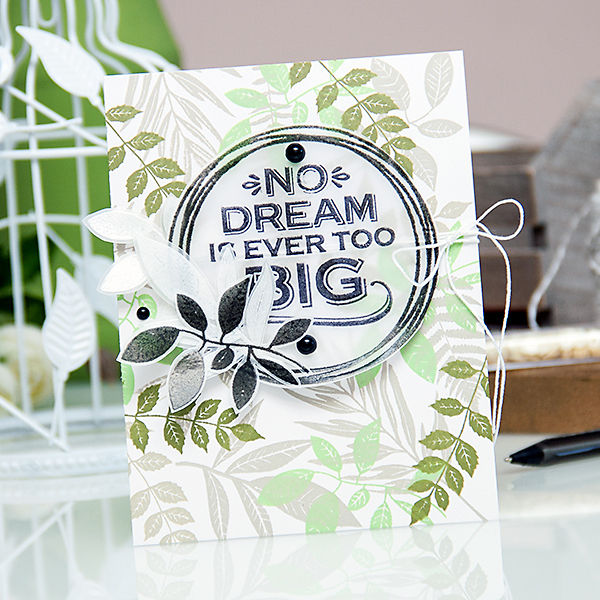 Perfect for your beautiful card!